Imagine the surprise and excitement on your guests faces when after serving the meals or mingling with guests, acting as waiters, Chefs or event policeman they suddenly start singing into a big show stopping songs. We have a wide selection of songs they can perform at your event. Singing Waiters Liverpool & Singing Chefs Liverpool are the perfect way to create an atmosphere for your event or wedding. Your Singing Waiters can also tailor make the music program to suit you and your guests taste. Your surprise singers Liverpool will base the music around your choice of songs. As long as the song is available, our singing waiters can learn songs especially for you. They will mingle as waiters, or chefs, blending in with the professional catering team or venue staff, pouring wine, serving and clearing tables, etc. Naturally, your wedding or corporate guests will assume they are simply part of team waiting staff at your Liverpool venue. At a given moment, usually after dessert is served “the singing waiters or surprise singer discussed as a Chef” will ‘stage’ a scene which results in a waiter singing a song. Singing waiters then take your guests completely by surprise as, one by one, they launch into song. The whole room looks around in total amazement and a few other waiters start to sing as well. The whole ‘act’ includes two hours of entertainments depending on which singing waiters act you book. 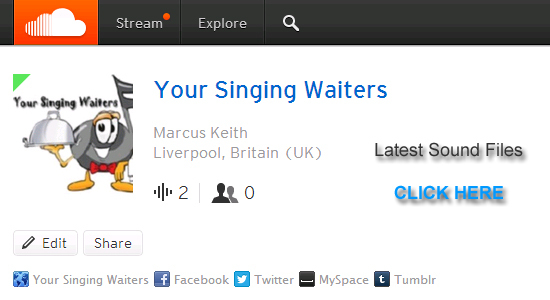 Your singing waiters for your next big event weddings, birthdays, weddings! Create the perfect atmosphere. Two of the most popular singing waiters offers a unique entertainment experience. Singing Waiters for hire in any of the following areas of the UK. 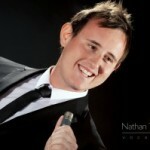 For further information on singing waiters Marcus Keith & Nathan Turner please fill in our singing waiters contact form.